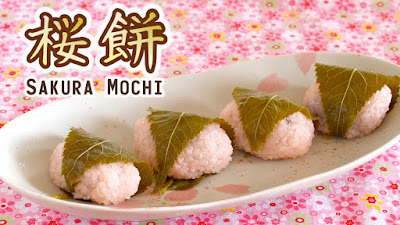 Sakura Mochi is Wagashi (Japanese confectionery) which is pink like Sakura (cherry blossom). This video will show you how to make Kansai-style Sakura Mochi. Kansai-style uses Domyoji powder (it is made of Mochi rice steamed, dried, and pounded very rough). The Mochi cake has rough and chewy texture. Anko is wrapped inside and covered with salty Sakura leaf. The leaf is edible but it is up to you (you can remove it). Kanto-style has a pink crepe-like rice cake around the Anko. 1. Soak salt pickled Sakura leaves in water for 30 minutes to remove the salty flavor. Then drain well with paper towel. 2. Roll Koshian into 10 balls (15g each). 3. Place warm water in a microwavable bowl. Add a bit of red food coloring till you get pastel pink. Add sugar and mix well. Then add Domyoji powder and mix again. 4. Cover with plastic wrap and microwave at 600 watts for 6 minutes. When it's done, leave in the microwave for 10 minutes to set. 5. Uncover and mix well. Place it in plastic wrap and shape into a log. Cut the log into 10 pieces. 6. Moisten your hands with water and flatten out the rice cake. Wrap the Anko and form the rice into a cylinder. 7. Wrap with Sakura leaves to finish. If you don't have Domyoji powder, you can cook Mochi Rice and pound.